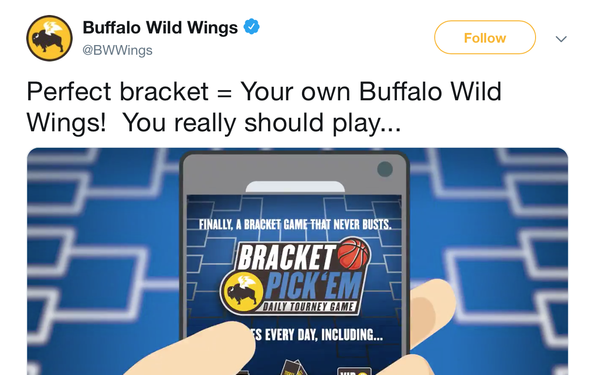 Buffalo Wild Wings has several activations around March Madness, including a promotion geared toward men who have specifically chosen this time of year to have vasectomies so they can recover from the snip while taking in the tournament. “That’s March Madness,” which begins airing March 13, takes a stand against fans watching games under sub-par conditions, and encourages them to watch them at Buffalo Wild Wings. “We’ve been taught that you can watch the games anywhere -- be it your phone, your office cubicle or the basement in your wife’s house, but as true sports fans, we know the unrivaled experience of watching the tournament across hundreds of TVs with wings, beer and your best friends by your side,” stated Seth Freeman, chief marketing officer, Buffalo Wild Wings. The campaign was developed by The Martin Agency, marking its first work for B-Dubs since being named lead creative agency in November 2018. The creative features “That’s March Madness, "Buffer" and "Overtime" -- which only airs (during the first commercial break) if a tournament game goes into overtime. As part of the campaign, Buffalo Wild Wings is also introducing an in-restaurant response to the spike in vasectomy procedures during the NCAA tournament, when thousands of men coordinate their doctor-ordered R&R to coincide with the biggest sports week of the year. With these recovering patients in mind, B-Dubs developed the Jewel Stool, a custom-built barstool featuring a built-in cooling apparatus in just the right place to provide numbing relief, as well as a chilled cup holder and a “beer me" light. Jewel Stools will be available on a first-come, first-served basis throughout March Madness at Buffalo Wild Wings' Times Square (New York) and Koreatown (Los Angeles) restaurants. A video promotes the unique contraption. Finally, the restaurant is offering an unbustable pick’em game with over 500 prizes including the chance to win your own Buffalo Wild Wings location. Each round brings new game picks and props so folks can win every time they are watching March Madness at the sports bar. Even if players lose a game on Day 1 or 2, they still have the chance for prizes. For picking an entire day correctly, players will win a "VIP Experience: Free Wings for a Year" and will be immortalized in a plaque at the local B-Dubs.